This letter post is my 1,500th post on this blog. I thought about delaying this letter and writing something else to mark the occasion, but then I realized that this weekly letter which usually has an update on my garden is a fitting way to mark this occasion. When I first started blogging, somewhat tentatively back in 2004, I posted a grand total of seven times between 2004 and 2005, and prior to that I deleted the first blog I started. During those first few years of blogging, it felt like I was planting tiny seeds in a giant field and it was hard to see amongst the vastness of the field if my little blog seeds were germinating or taking root. Did anyone see them? Was anyone out there? Hello? Can you hear me? It seemed a bit futile. Then in 2006, I started to see my little blog seeds germinate more frequently. I saw them grow and realized, through comments on my blog, that others were watching my seedlings grow, too. So I planted more blog seeds and sometimes plants. I watered them and pruned them and could see some of them flower. At the same time, I stopped looking just at my little blog seedlings and found the blog seeds and plants that other garden bloggers were sowing and planting, and I started to help them water and nourish theirs, too. We helped each other! We told each other how much we admired our blog seedlings and plants and whole gardens. We encouraged one another. And that’s why this letter is a fitting post for my garden blogging milestone. Garden blogging, as it turns out, is not so much about sowing and planting blog seeds and plants, i.e. posting on your blog, as it is about making connections with other gardeners and encouraging them in their own pursuits of gardening and writing, and living. And that’s what these letters symbolize. Connections to not just Dee and Mary Ann, but truly connections to gardening friends everywhere. Thank you to all who have encouraged me, humored me, and admired my little blog seedlings and plants and helped to nourish them along the way to this milestone of 1,500 posts. It truly has been a blessing to garden and blog with each one of you, to read about your gardens and lives, to learn from so many passionate gardeners and to even meet in person! Carol -- you've definitely been an inspiration. Thank you for your pioneering spirit. Thank you for looking back at the beginning. My blog is in it's second year and I'm still in that phase of "is anyone besides my mother reading this?" It's good to know that I have a chance to have my voice heard, if I persist and continue to improve my postings. And major congratulations on your 1500 post! Congratulations Carol, it's wonderful that you have kept going. Congrats of 1500 posts. H.
At the forefront of the garden blogging movement, you have inspired, informed and entertained many of us. Congratulations on 1500 posts. That is quite an accomplishment. Congrats Carol 1,500 post Wow!.. You bought education, entertainment and laughter to us all I really enjoy it! I am so glad you kept at it Carol. Your blog is such a great read. Congrats on 1500. Many congratulations on 1500 and best wishes for many more! You have been an inspiration everytime I come to your Blog...I love your musing and posts and well everything. I learn something new all the time from Garden bloggers like yourself. Congrats on 1,500. Congrats on this great milestone, Carol! Carol, it's not just that you've written 1500 posts, but that they have been thoughtful and/or entertaining and/or intelligent and/or humorous and/or insightful and/or informative AND/or on and on ... you're an inspiration to many of us. I look forward to many more years of growing with you! Yes, it's about the connections we make. Good advice to newbie bloggers, and a reminder to us old-timers who sometimes feel too busy to leave a comment. I still read a lot of blogs but have less time to comment than before. I'll try to do better with that, to help water those seedlings! Congratulations Carol! I've enjoyed your blog so much over the years and I'm glad you now have help from the cast of characters that frequent May Dreams Gardens. This really is a major milestone and you should be really proud of yourself...I'm certainly impressed. Enjoyed your post, today. Wow, what a log of blogging! I have been enjoying peeking in on your blogs, so keep up the great work. Thank you for sharing your garden and all its wonders. Yours was one of the first blogs I read, and it's still as fresh as in 2007. Congratulations on this blogging milestone! Wow you have had alot to say! Congrats on 1500 posts! You have a great blog! I still think a book is in you. Congratulations! What a wonderful milestone! Always enjoy catching up on your news. I've just found your blog for the first time, since I've just started to blog about gardening just recently. I feel your passion and sincerity about gardening, and you are an inspiration to me. I've been a Nursery man, for many years, but I've got a lot of work to do to improve my blogging. Thanks for your service, and your inspiring ideas to your fellow gardeners. Congrats on the 1500, Carol - you have been an inspiration. Your garden blogs do seem to have grown according to the classic horticultural pattern, didn't they? Sort of first stage Sleep, second stage Creep, third stage Leap... guess in this fourth stage you Reap the rewards of your diligence and patience. Carol, your blog was one of the first I found when I barely knew what a blog was in 2007. You were a constant inspiration and teacher - as were people like Kathy Purdy at Cold Climate Gardening. the great joy of this summer was meeting so many of the bloggers face to face in Buffalo who have been so important to me in the garden, and in my writing life. Hi... I just stumbled accross your blog while looking for information on cue ball zuchinnis. I noticed in your post that you mentioned that you (like every good gardener that I know) foist veggies off on visiting friends. 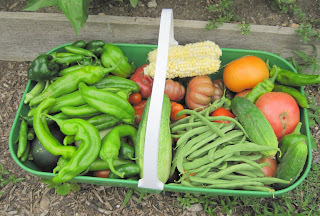 I would like to put the proverbial bug in your ear that perhaps you and your gardening friends might consider, in addition, donating your surplus garden produce to homeless shelters or food banks. We are growing a large garden this year (our first garden) and will be donating all of the produce to a homeless shelter for families near our house. All of the food donations that they currently get are canned and boxed and they never get any fresh fruits or vegetables. Who could appreciate the fabulousness of your fresh delicious, produce more than people who cant get any on their own? What wisdom from a blogging old-timer -- 1,500 posts! Congratulations. It does seem like a vast field sometimes, but I shudder to think of going back to gardening alone again, without blogs. Thanks for all you write, Carol. Just catching up with your posts after holidays - aka vacation ;) after weighing all the evidence (organising Malvernmeet, carrying a digital camera at all times, starting Out on the Streets etc etc) I fear I must be amongst the geekiest of all garden bloggers - and proud of it!